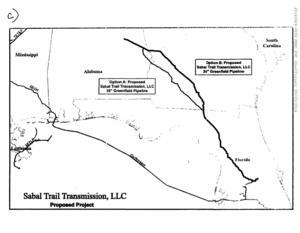 Sabal Trail Transmission, LLC, hereafter referred to as STT, changed the FPL route, at their discretion, to originate in Eastern Alabama and to run through Georgia into South central Florida ((C) see attached STT map). The new route is approximately 465 miles in length and would save millions of dollars in cost. 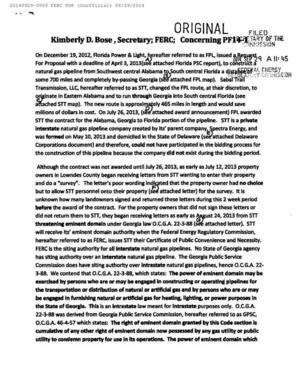 On July 26, 2013, ((D) see attached award announcement) FPL awarded STT the contract for the Alabama, Georgia to Florida portion of the pipeline. 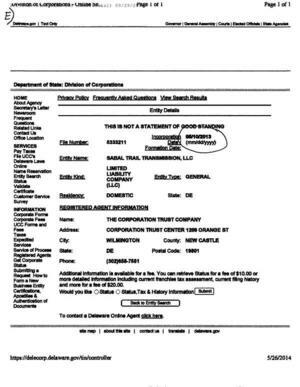 STT is a private interstate natural gas pipeline company created by its’ parent company Spectra Energy, and was formed on May 10, 2013 and domiciled in the State of Delaware ((E) see attached Delaware Corporations document) and therefore, could not have participated in the bidding process for the construction of this pipeline because the company did not exist during the bidding period. 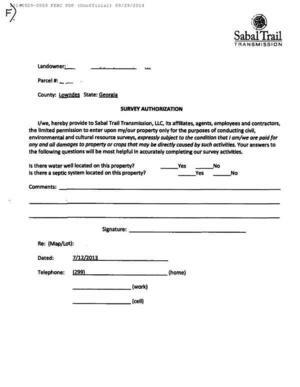 Although the contract was not awarded until July 26, 2013, as early as July 12, 2013 property owners in Lowndes County began receiving letters from STT wanting to enter their property and do a “survey”. The letters poor wording indicated that the property owner had no choice but to allow STT personnel onto their property ((F) see attached letter) for the survey. It is unknown how many landowners signed and returned these letters during this 2 week period before the award of the contract. 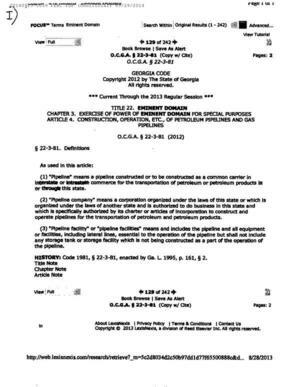 The power of eminent domain may be exercised by persons who are or may be engaged in constructing or operating pipelines for the transportation or distribution of natural or artliiclal gas and by persons who are or may be engaged In furnishing natural or artificial gas for heating. lighting, or power purposes in the State of Georgia. The right of eminent domain grantnd by thls code section is cumulative of any other right of eminent domain now possessed by any gas utility or public utility to condemn proporty for use in its operations. The power of eminent domain which was granted and conferred by Ga. L. 1929, p. 219, upon persons engaged in constructing or operating pipelines for the transportation or distribution of natural or artificial gas and upon persons engaged in furnishing natural or artificial gas for heating, lighting, or power purposes in this state, and the manner of exercising such power eminent domain as provided In Chapter 1 of Title 22 and Article 1 of Chapter 2 of Title 22 is ratified, confirmed, and continued. 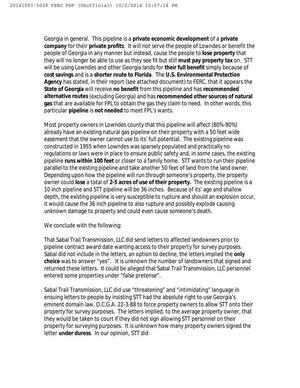 In our view, STT being a private interstate natural gas pipeline construction company cannot enforce an intrastate law upon the people of Georgia or Lowndes County because STT is neither a gas utility nor public utility, it is only a private interstate pipeline company. 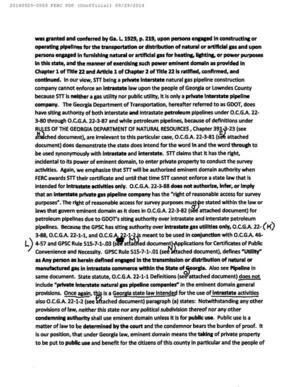 The Georgia Department of Transportation, hereafter referred to as GDOT, does have siting authority of both interstate and intrastate petroleum pipelines under 0.C.G.A. 22-3-80 through 0.C.G.A. 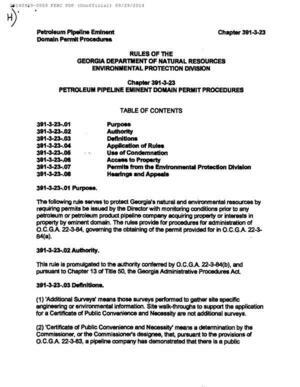 22-3-87 and while petroleum pipelines, because of deﬁnitions under RULES OF THE GEORGIA DEPARTMENT OF NATURAL RESOURCES, Chapter 391-3-23 ((H) see attached document), are irrelevant to this particular case, O.C.G.A. 22-3-81 ((I) see attached document) does demonstrate the state does intend for the word in and the word through to be used synonyrnousiy with intrastate and interstate. STT claims that it has the right, incidental to its power of eminent domain, to enter private property to conduct the survey activities. Again, we emphasize that STT will be authorized eminent domain authority when FERC awards STT their certificate and until that time STT cannot enforce a state law that is Intended for Intrastate activities only. O.C.G.A. 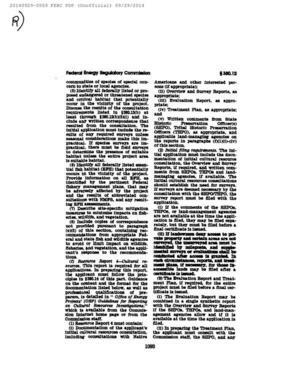 22-3-88 does not authorize, infer, or imply that an interstate private gas pipeline company has the “right of reasonable access for survey purposes”. The right of reasonable access for survey purposes must be stated within the law or laws that govern eminent domain as it does in 0.C.G.A. 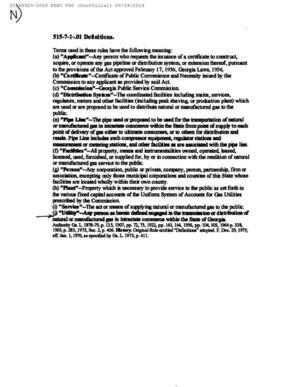 22-3-82 ( (J) see attached document) for petroleum pipelines due to GDOT’s siting authority over intrastate and interstate petroleum pipelines. Because the GPSC has siting authority over intrastate gas utilities only, O.C.G.A. 22-3-88 (K), 0.C.G.A 22-1-1, and O.C.G.A. 22-1-2 (M) is meant to be used In conjunction with 0.C.G.A 46-4-57 (L) and GPSC Rule 515-7-1-.03 ( (M) see attached document) Applications for Certificates of Public convenience and Necessity. 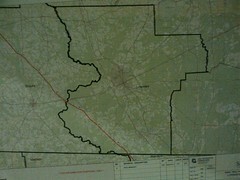 Any person as herein defined engaged in the transmission or distribution of natural or manufactured gas in Intrastate commerce within the State of Georgia. Notwithstanding any other provisions of law, neither this state nor any political subdivision thereof nor any other condemning authority shall use eminent domain unless It is for public use. Public use is a matter of law to be determined by the court and the condemnor bears the burden of proof. To whom it may concern: page three of my letter was left out by whomever. Here it is again if you would be so kind to put a Q with a pen over the (see attached document). Georgia in general. This pipeline is a private economic development of a private company for their private profits. It will not serve the people of Lowndes or benefit the people of Georgia in any manner but instead, cause the people to lose property that they will no longer be able to use as they see fit but still must pay property tax on. STT will be using Lowndes and other Georgia lands for their full benefit simply because of cost savings and is a shorter route to Florida. 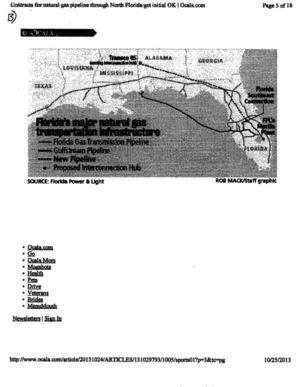 The U.S. Environmental Protection Agency has stated, in their report (see attached document [Q]) to FERC, that it appears the State of Georgia will receive no benefit from this pipeline and has recommended alternative routes (excluding Georgia) and has recommended other sources of natural gas that are available for FPL to obtain the gas they claim to need. In other words, this particular pipeline is not needed to meet FPL’s wants. Most property owners in Lowndes county that this pipeline will affect (80%-90%) already have an existing natural gas pipeline on their property with a 50 feet wide easement that the owner cannot use to its’ full potential. The existing pipeline was constructed in 1955 when Lowndes was sparsely populated and practically no regulations or laws were in place to ensure public safety and, in some cases, the existing pipeline runs within 100 feet or closer to a family home. STT wants to run their pipeline parallel to the existing pipeline and take another 50 feet of land from the land owner. Depending upon how the pipeline will run through someone’s property, the property owner could lose a total of 2-5 acres of use of their property. The existing pipeline is a 10 inch pipeline and STT pipeline will be 36 inches. Because of its’ age and shallow depth, the existing pipeline is very susceptible to rupture and should an explosion occur, it would cause the 36 inch pipeline to also rupture and possibly explode causing unknown damage to property and could even cause someone’s death. 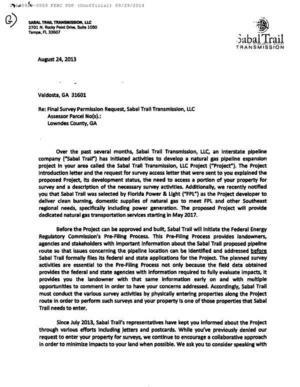 That Sabal Trail Transmission, LLC did send letters to affected landowners prior to pipeline contract award date wanting access to their property for survey purposes. Sabal did not include in the letters, an option to decline, the letters implied the only choice was to answer “yes”. It is unknown the number of landowners that signed and returned these letters. It could be alleged that Sabal Trail Transmission, LLC personnel entered some properties under “false pretense”. abuse and misuse 0.C.G.A. 22-3-B8 to gain entry to some properties for surveying purposes. We conclude that STT does not have the right Incidental to its power of eminent domain, using O.C.G.A. 22-3-88, to enter private property to conduct the survey activities. STT will receive its power of eminent domain from FERC when FERC issues STT the certificate, and therefore the right to enter private property for survey purposes. If landowners deny access to private property and certain areas are not surveyed, thd unsurveyed area must be identified by mile post and supplemental surveys or evaluations shall be conducted after access is granted. In such circumstances, reports, and treatment plans, if necessary, for inaccesible lands may be filed after a certificate is issued. ( (R) see attached document). The survey activities will cause substantial harm to the landowners, and the surveys will disserve the public interest. If a landowner’s property is surveyed, it is almost certain the pipeline will be on his/her property. 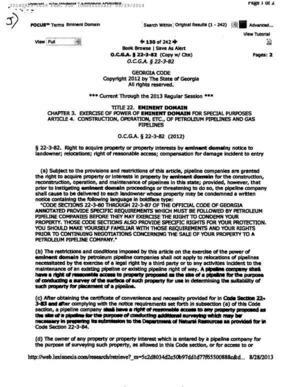 with 2 pipelines on one’s property, the value of the property will certainly decrease as will the property adjacent to the “pipeline” property ( (S) see attached document). This is certainly a disservice to one’s neighbors, the public’s interest. 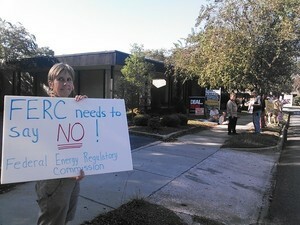 Sabal Trail will not suffer irreparable harm to its loss of good will and business reputation should it have to delay until FERC Issues the certificate in order for Sabal to survey properties. This pipeline is its very first undertaking and has not yet established a reputation within the Industry/business community. 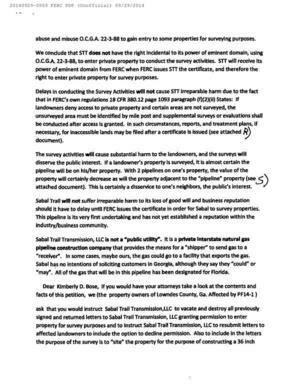 Sabal Trail Transmission, LLC is not a “public utility”. It is a private interstate natural gas pipeline construction company that provides the means for a “shipper” to send gas to a “receiver”. In some cases, maybe ours, the gas could go to a facility that exports the gas. Sabal has no intentions of soliciting customers in Georgia, although they say they “could” or “may”. All of the gas that will be in this pipeline has been designated for Florida. 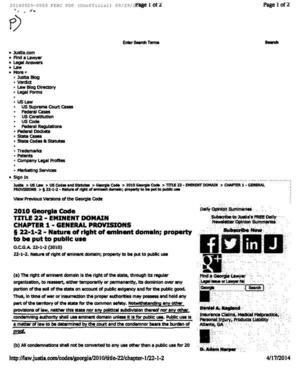 Dear Kimberly D. Bose, if you would have your attorneys take a look at the contents and facts of this petition, we (the property owners of Lowndes County, Ga. affected by PF14-1) ask that you would instruct Sabal Trail Transmisslon,LLC to vacate and destroy all previously signed and retumed letters to Sabal Trail Transmission, LLC granting permission to enter property for survey purposes and to instruct Sabal Trail Transmission, LLC to resubmit letters to affected landowners to include the option to decline permission. Also to include In the letters the purpose of the survey is to site’ the property for the purpose of constructing a 36 inch natural gas pipeline on the property to be surveyed. 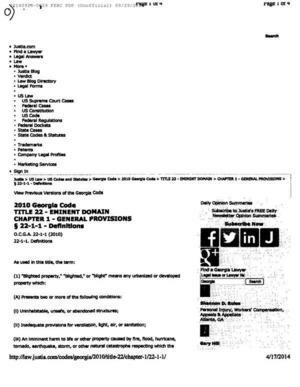 We also ask you, Kimberly D. Bose, to make Null and Void all previously performed survey activities and that Sabal Trail Transmission, LLC can only resurvey those properties that the owners give explicit permission to do so in the new letters. I think if you were to do this, you would find that many, many more property owners now have a better understanding of what Is happening to them and their property than there was before and that no one in Georgia wants this pipeline except maybe Nathan Deal. But you see, he has been accepting campaign contributions from SPECTRA and last time we totaled they were over $21,000. So now you understand why we can’t go to our own governor for help and the situation might be just as bad with our local govemment. You don’t have to take my word for this. Just go to Spectrabusters.com and look for yourself. They have documented all of the campaign contributions. 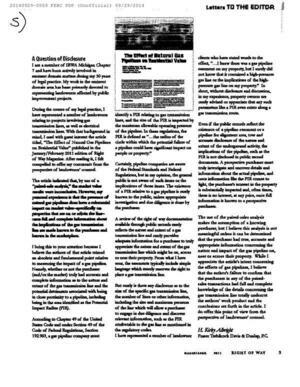 He also threw in a copy of EPA’s 23 April 2014 ecomment, which questions any need for the pipeline. It was referenced in the missing page 3. 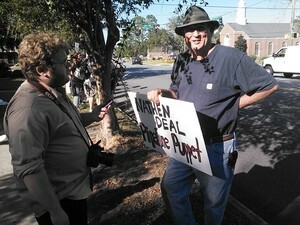 See also Bill and Nanci Kendall in the VDT with protest signs. Is there a “list” of property owners available for Suwannee County and Hamilton that have been surveyed and is available to the Public? If so, with the “proposed” alternate routes still being explored is there a need to Inform/notify of a rights of landowners in this locations?